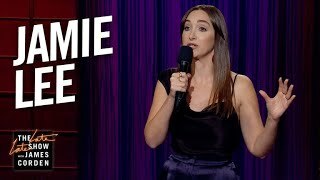 Jamie Lee is an actress, author and stand-up comedian, currently starring as the female lead in Season 2 of HBO's "Crashing." She formerly wrote on Season 1 of the show as well as "Teachers," "Talk Show: The Game Show" and more. She was a core cast member on the hit MTV series "Girl Code" and was the host of TruTV's "10 Things." As a stand up, she has appeared on "The Late Late Show with James Corden" and "Conan" and, in 2016, Lee released her debut book "Weddiculous" with Harper Collins. Her new stand up album "I Mean..." was released on January 19th to glowing reviews.